I picked this novel up from a massive pile of free books offered by my university a few weeks before Christmas. The only reason I selected it is because it’s published by Faber and Faber: that’s how much of a caricature I have become. 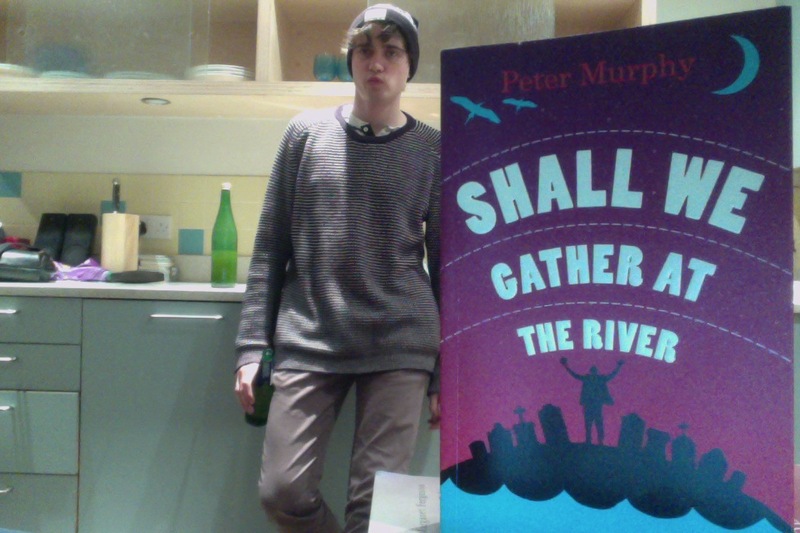 Shall We Gather At The River is Peter Murphy’s second novel, and it’s quite a strange read. It centres on the coming of a flood to a small Irish town, a flood that will cause a spate of suicides and a flood that has been predicted by a long-dead radio-enthusiast. Though the book feels like it will be the interlinked stories of the nine people who throw themselves into the water, it isn’t. Although the reader is given glimpses into the lives of each of these characters, they are all peripheral – the firm lead being Enoch O’Reilly: southeast Ireland’s first radiovangelist, a huge fan of Elvis and a borderline devout atheist. Enoch is a great character – he is mysterious, he is conflicting, and he is charming. Despite his lack of belief, he craves a career spouting godly praise due to hearing riotous, terrifying preaching in the dead of night on his father’s radio equipment. His father is the radio operator who predicts (and believes in his prediction of) the flood. The book captures provincial Ireland well. Several sections of the book read as short stories – I suppose are short stories – and these are well realised and entertaining. A piece about children scaring an old man into a heart attack and later calling up the hospital to make sure he’s ok; a story about a man goaded into driving across the country to find a run away lover, only to realise he was sent there as a prank… And there are many more like this – snippets from radio interviews with a psychiatrist, a frustrated lesbian discovering prostitutes in Amsterdam, a local DJ bored in a night slot… Murphy creates an array of characters, many of whom I would like to have read more about. But Enoch dominates, and I can perhaps see why. His transformations throughout the book – the different stages of his life he appears at – offer a compelling and confusing narrative deliberately filled with huge chronological gaps. But Murphy kept me interested. And entertained. There was a magical realism element to it too – lots of references to old Celtic myths, to their equivalents around the world too… Lots about Catholicism, lots about drinking, lots about people in a small town in the countryside. It works well as a collage, though this is perhaps also its fault – though the many stories succeed, the narrative of Enoch O’Reilly feels disappointingly brief – are the other stories there to pad out a mini-novella into a short novel? I don’t think so. But I think it’s a fair criticism. I like Murphy’s writing, I like his topics, I like his relaxed approach to playing with form. This is a good book, but not quite a great one. I’d be interested to read more by him, though. Which isn’t something I feel very often. Worth reading if it falls into your lap, definitely: as a free read, I’m more than happy with it.